Surfing on Bondi Beach. Image: Let's Go Surfing! This Australian Honeymoon: Sydney, Reef, and Whale Sharks package was designed for a couple of avid divers from New York. They wanted to make their honeymoon extra special with two “bucket list” experiences: scuba diving in the Great Barrier Reef and swimming with whale sharks! We started their Australian Honeymoon at the Great Barrier Reef. They spent 3 days, 2 nights on a comfortable, live-aboard catamaran with spacious suites and fabulous dining options. On this incredible adventure, they got to experience 8 day dives and 2 night dives in the one and only Great Barrier Reef. Truly a bucket list moment! Next for their Australian Honeymoon, we sent them to sunny Sydney. They had plenty of leisure time to explore Australia’s largest city, with its gorgeous beaches, sparkling harbors, and world-class cosmopolitan offerings. Their hotel was mere steps away from the famous Bondi Beach, a favorite of the locals. They also enjoyed some of the beautiful coastal walks to some of the lesser known beaches. While in Sydney, they simply had to try surfing! They took a 2-hour surf lesson on Bondi Beach with our mates Let’s Go Surfing to learn the basics. They were even able to catch a wave on their own at the end. Continuing their Australian Honeymoon, the made the long-haul flight over to Exmouth, the gateway to Ningaloo Reef. This incredible reef system is the only reef directly accessible from the shore. It’s also known for the massive whale sharks that visit daily during the season. They were able to swim with these gentle giants in their natural habitat. They also had 2 days of diving in Ningaloo Reef and the spectacular Muiron Islands. Bringing their Australian Honeymoon to a close, they flew to Perth for a quick overnight before catching an early flight to Sydney and then back home. Welcome to Australia! Start your trip in Cairns, gateway to the one and only Great Barrier Reef. 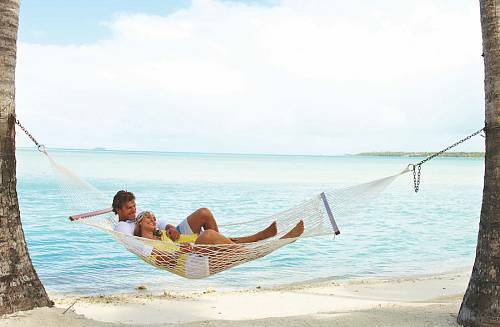 Enjoy an evening at leisure to recover from jet lag and gear up for your spectacular diving adventure! Get ready for the ultimate diving adventure, with 3 days/2 nights aboard the Reef Experience live-aboard diving boat! 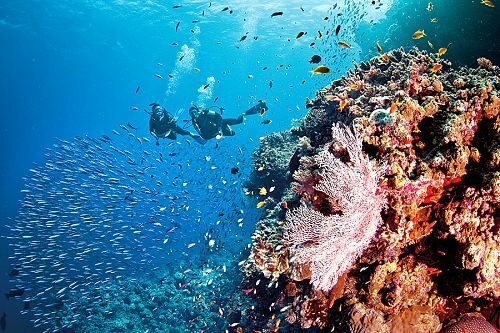 The Great Barrier Reef is every diver’s paradise, with more fish species, coral types, and marine life than anywhere else on the planet. 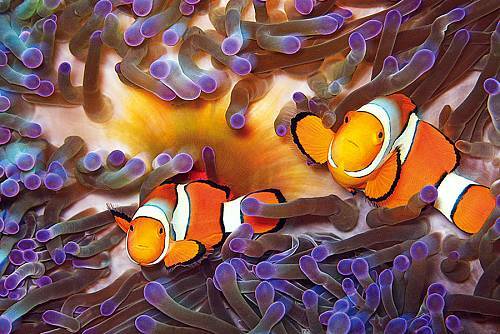 Swim with reef sharks, giant clams, and an abundance of other colorful, tropical sealife. Over 3 days, you’ll enjoy 7 day dives and 3 night dives, plus unlimited snorkeling. VIP service, a dedicated crew member to meet your every need, and gourmet meals onboard will ensure you enjoy your time onboard as much as your time in the reef. On the third night, overnight at a Cairns hotel. Today, you’re on to spectacular Sydney, a world-class city that offers style and sophistication. Fringed by numerous bays and beaches and presided over by the glistening Opera House, Sydney unveils a great photo opportunity at every turn. With iconic landmarks, beautiful beaches, exceptional dining and shopping, vibrant neighborhoods, and friendly locals, Sydney has something to offer every type of traveler. Your hotel is just steps away from the famous Bondi Beach. Today is at leisure to enjoy the parts of Sydney that interest you most. Perhaps you’d like us to add a gourmet lunch cruise on Sydney Harbour, or maybe you’d like to dive with sharks in Sydney’s downtown aquarium. The Blue Mountains, 2 hours outside Sydney, are great for wildlife lovers. Or, explore the city at your own pace with walks through The Rocks Historic District, the Botanical Gardens, or Paddington. Spend the day like the locals do… grab your swimming costume and your sunnies and hit the beach! Bondi Beach is one of the most popular and picturesque urban beaches in Australia. Frequented by city-siders and suburbanites alike, it is chock-a-block all summer with sunbathers and surfers. If you haven’t surfed before, today is your chance! During your 2-hour surf lesson, you will learn the basics and by the end, hopefully you will be able to catch a wave on your own. Today, fly the full width of the country to Western Australia. 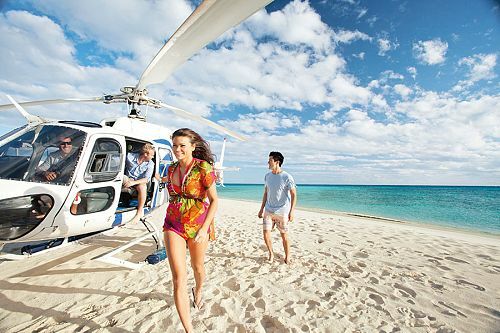 Fly to Exmouth, the jumping off point for Ningaloo Reef. Australia’s second reef is the largest fringing reef in the country and the only reef directly accessible from the shore. It’s also one of the best places in the world to swim with giant whale sharks! It’s time to cross an item off your bucket list: swimming with whale sharks! These gentle giants average 40 ft in length. From late March to August each year, the whale sharks converge on the nutrient-rich waters of Ningaloo Reef. Over the next 4 days, you’ll dive the top spots in Ningaloo Reef and have the chance to see these amazing creatures in the wild. The reef is also home to an abundance of colorful coral, as well as dolphins, dugongs, manta rays, and countless other sea creatures. 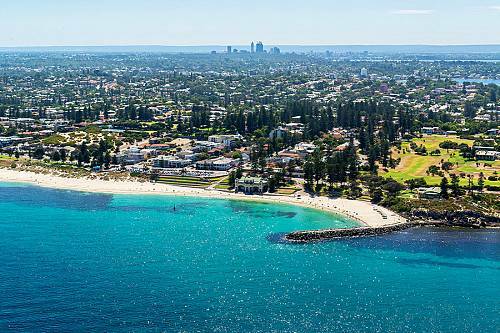 Fly to Perth, the largest city in Western Australia and the most remote metropolitan city in the world. Explore some of the fabulous cafes and restaurants in this quirky town, or perhaps relax on a pristine beach just minutes from the city. Today, fly back through Sydney and head home. You will be reeling from your unforgettable underwater experiences and wondering how your next dive trip can even come close to this amazing adventure!